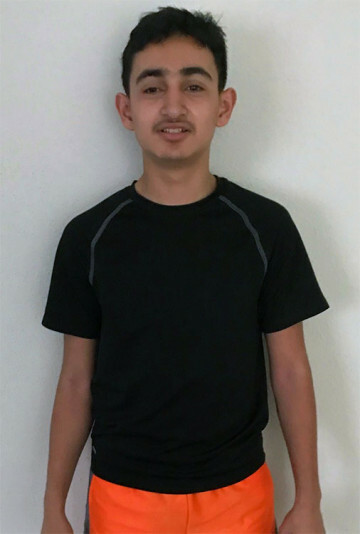 Adrian is a teenage boy who can be introverted at times, but when he warms up to people he can be very expressive. He likes to hang out with other children his age. He receives speech support services and occupational support services. He is improving in his speech and has reported his friends say he is able to speak more clearly. Adrian's interests align more with that of a younger child. He loves to watch and play sports like any typical teenage boy. His favorite basketball team is the Cavaliers. He likes to watch the Texans play and hopes to be in the pros one day. He was able to play on the football team in school and was on the track team as well in school. He was able to make a few track meets where he competed against other local schools in the area. He enjoys playing Madden on the PlayStation 4. He loves all types of music. Adrian enjoys going to art class, and especially likes to draw. He hopes to go to art school to perfect his craft to one day be a painter. Adrian is able to adjust to new environments relatively easily. He will do best in a safe nurturing home that kept in him age appropriate sports. Adrian enjoys to eat most foods. Adrian and Angel are brothers who have a good relationship with one another for the most of the time. Adrian is the older of the two. They enjoy playing outside with one another. They also enjoy playing NBA 2k and other video games. They both enjoying running and being actively involved in their community; participating in different school events. Adrian and Angel each have their own specific interests. Adrian likes football while Angel enjoys playing basketball. Adrian is the more artistic of the two while Angel enjoys cleaning up as a hobby. Like most siblings, they get along but they do have their normal sibling competitiveness that occurs on occasion. Adrian and Angel want to be adopted together. Adrian can be placed in either a two parent home or a one-parent home. He needs a home that will be able to care for his long term needs. He needs to be with a family who will be patient and adhere to all his needs. He needs a family who is loving and affectionate and can devote time to him. Adrian will do best in a safe nurturing home where his family will ensure he is able to participate in him age appropriate sports. He would like an actively involved family who is into sports.